With Chezy Champs just around the corner we thought it fitting to introduce one of the members of the GameSense crew that will be doing commentary at the event. Ty Tremblay has a long history in FRC. Ty's story reads like a promotion for FIRST and introducing students to STEM. Like many people he was introduced to FRC in a "unique" way and was hooked throughout high school. He attended a university that is heavily involved with FRC and mentored team 190 while getting his degrees in Robotics Engineering. 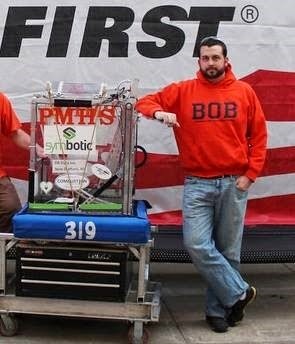 He's now an engineer for a robotics company and he returned to mentor his high school team. You can't write an FRC success story better than this. Be sure to read the rest of his article and listen to him and the rest of the GameSense crew this weekend on the Chezy Champs webstream. While in high school, I was dead set on becoming a professional chef. I would leave my school early every day to take a bus to the local vocational school. The vocational school has a restaurant and a full kitchen, and it was there that I was learning how to prepare and cook food. I loved it and looked forward to cooking class every day. One day in December, I was running late. The bus was going to leave me and I was going to miss my favorite part of school. My path to the bus was a winding one due to the Industrial Arts room (woods, metals, etc.) being in the way. I took a shortcut through the IA room that day because I knew the teacher well. What I didn't know was that it would change my entire life’s path. Mr. Hikel was there with FIRST Robotics Team 319 and their 2003 robot, driving around. As soon as I opened the door, the driver lost control of the robot and I was directly in its path. The robot backed me against a wall and nearly hit me before the team could stop it. “Ty, meet Bob. Bob, meet Ty,” Hikel said. I never went to culinary class. I joined Team 319 that day and it’s been robots ever since. I found out about WPI through my involvement with FIRST just as they were introducing the first ever Robotics Engineering Bachelor’s Degree. 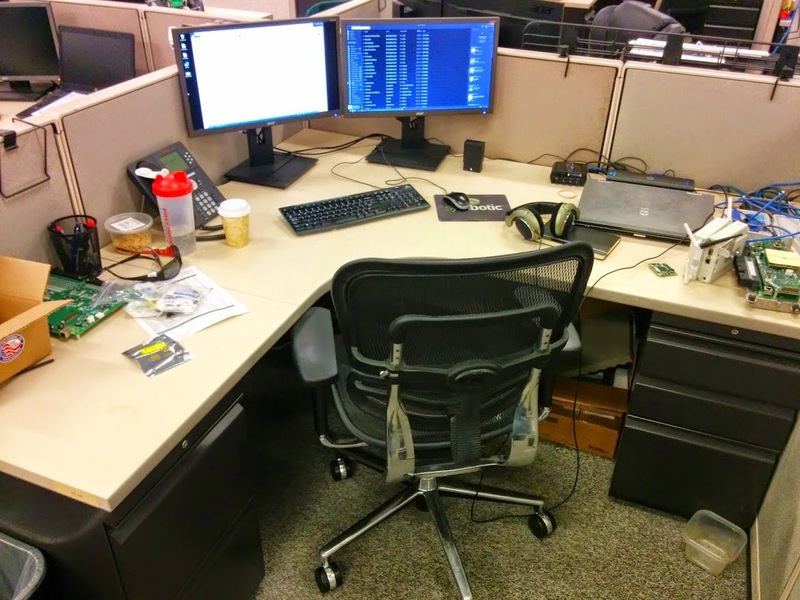 I applied, got in, got my Bachelor’s Degree, got my Master’s Degree, and now I work at a robotics company on the forefront of the robotics revolution. Cooking is still a major passion for me, but I’m glad I don’t have to do it for a living. Robots are much more fun. I am a Manufacturing Test Engineer at Symbotic, LLC where we make warehouse automation technology. I love the job because it’s different every day. One day I’ll be writing software and the next I could be designing complex mechanical systems, or developing a circuit, or even travelling across the country to support a customer. Robotics is an incredibly multi-disciplined field, and my job lets me take advantage of my multi-disciplined education. In the past, I’ve worked at iRobot on the PackBot team and at Hologic, a medical devices company. I also have a night “job” in that I’m a host on the new FRC web show GameSense. We’re a group of alumni and mentors that get together on Wednesday nights with experts from all over FRC to discuss the game, upcoming and previous weeks’ events, and other FRC topics. We’ll also be kicking off our live event coverage with GameSense @ Chezy Champs at the end of August! Despite it being about me, see my inspiration story. You’re really going to make me pick one? No, I refuse. I’m going to pick 4 (in order) because they all made everyone in FIRST say the same thing. One of my dreams in FIRST, and in my engineering career, is to develop robots and mechanisms that make people say one simple phrase. 1. 71 (2002) – I’m sure this has been said before, but it deserves to be repeated, and repeated, and repeated. This robot is the epitome of excellent strategic analysis meeting superior engineering. Beatty developed a machine that, if it accomplished its match tasks, literally couldn’t lose. Interesting caveat for that year, however, is that rankings relied heavily on points and 71 didn’t sore many of those. As a result, 71 was rarely in the top spot despite winning almost every match they played. 2 469 (2010) – The ball returner strategy was attempted by very few teams, but still a few more than 71’s 2002 Beast. Regardless, no one pulled it off as well as 469 did. They had to be in a certain spot in order to execute. “So just prevent them from getting there, right?” Wrong. They had a ridiculously strong drive train that you couldn’t push around. Oh, and they got there in autonomous anyway (even after scoring 2 balls). “Okay, we’ll just push them out from their spot.” Wrong again. They locked in to place so that no one could move them. (Side thought, what would happen if you pitted 71 from 2002 against a locked in 469?). “Fine, we’ll just block the balls they return.” Nope. They can choose which goal to score in. 3. 254 (2014) – This one is a little more subtle because it did almost all of the match tasks in a similar fashion to other robots. What sets 254 apart, however, is that they did everything much, much faster. Oh, and a 3 ball auto and almost couldn’t be blocked. 4. 190 (2004) – The best way to score points is to hang from the bar? Let’s do that. Only, let’s do it and then prevent anyone on the other alliance from hanging. And let’s do it in autonomous. What’s the second best way to score points? Oh right, the doubler. Let’s take that away from them too. This is the most 190 bot of all 190 bots. Solidworks, Visual Studio, Google Drive, Gmail, my Nexus 5. I have all of the same software on all of my computers, and Google Drive to sync everything. Two monitors at work, two monitors at home. I’ve always tried to be neat in that I have a place for everything, but nothing ever seems to get back in its place once I get distracted by something else. My favorite thing to listen to while I really need to crank out the work is Chillstep. I live and host GameSense in southern MA, work in northern MA, and mentor my team in central NH, so my schedule can get pretty hectic. During build season, I work 9 hour days on Monday through Thursday so I can leave after lunch on Fridays. This usually puts me at Team 319’s school by the time the team meets on Friday. I then work with the team through Sunday night, and do the 1.5 hour commute to work from NH on Monday morning. Once competition season starts, I’m usually taking vacation time on Thursdays and Fridays so I can go to events with 319 as well as volunteer. For GameSense, we have a tech call with our expert on Tuesday nights to prepare for our show on Wednesday nights. No matter how good you are at something, there is always someone better. Always. The thing to take away from this is that there is always someone you can learn from and there’s always someone you can strive to be as good as. To somewhat answer the question, though, I’d say I’m good at looking at a robot and very quickly understanding how it works. Oh, and I can cook a mean steak. It’s a deceptively simple phrase, but it’s been a driving force for me since I started college. Very little in life (read, almost nothing) is going to be given to you unless you deserve it. If you want something, you need to work for it. Sometimes, that work is as complicated as years of effort to get good grades so you can get into that college you want. Sometimes, it’s as simple as asking someone for help or advice. If you want that new car, you save up for it. If you want a blue banner, you build a team and a robot that can get you one. You won’t always get what you want, but you’ll have tried, and you’ll have bettered for yourself. As surprising as it may seem, the phrase “Fake it ‘till you make it” is actually good advice. You’d be surprised how far you can get, and how much you can learn, by portraying confidence even if you’re lacking it. Video games, Magic: The Gathering, and TV. Being a robotics engineer can be stressful work, so anything that helps me shift into another frame of thought, or turn off my brain completely is a welcome distraction. Fill in the blank. I'd love to see Art Dutra (148) answer these same questions. If you have any questions or advice, please feel free to email me at ty.tremblay@gmail.com. "Those without dreams are without ideals. Those without results are without happiness."